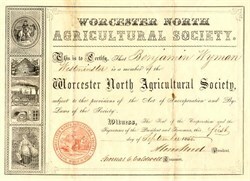 Beautifully engraved certificate from the Worcester North Agricultural Society issued in 1853. This historic document has a border around it with vignettes of a man on a horse, beehive, train, dog next to a safe and a woman carrying wheat. This item is hand signed by the Socirty's President, Moss Wood and Secretary, Thomas C. Caldwell and is over 152 years old. The Worcester North Agricultural Society was incorporated in 1852, and has extensive fair grounds and a trotting park in the easterly part of the township of Fitchburg. In the 1880s, the Society had exhibitions which included stock, plowing matches, trials of working oxen, exhibition in the hall, bicycle races, football, other athletic sports including a Grand Baseball Game, horse trot, horses, athletic sports, and races with prizes totaling $850 and other premiums offered by local businesses.